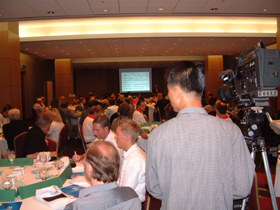 The inaugural WorldSkills Leaders Forum was held at the COEX in Seoul, Korea on Thursday, 13 September 2001. It was sponsored by WorldSkills´ Sponsor Partner Festo. 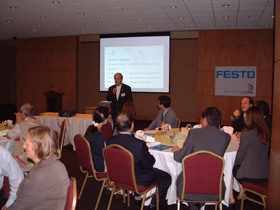 It was attended by over 120 Official Observers - and a small VIP delegation from Festo. 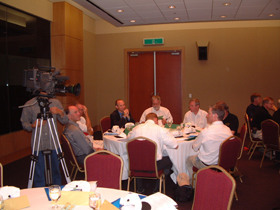 They first attended a session where 3 speakers outlined the aims of the Forum. This was followed by the opportunity to mingle and meet others over a buffet lunch. All who attended were encouraged to join the workshops of their choice at a later stage during the four day competition – and despite their heavy schedule over 60 people came back to those workshops. This event marks the first step in WorldSkills development of the Forum as an event designed to promote the exchange of best practices, new ideas and innovation and help delegates build international expert networks. The aims are outlined in the speeches below. The WorldSkills Competition 2003 in St. Gallen will witness the further development of this the WorldSkills Leaders Forum towards a congress on Best Practices and Innovation in Vocational Training and Technical Education. The Forum will address important aspects of vocational training and technical education – from new technologies and training methods to motivation techniques and image building – thus taking a further step towards the full achievement of the WorldSkills mission. Mr. Jack Dusseldorp - President of WorldSkills. Both Festo and WorldSkills are eager to enhance future competitions by running the WorldSkills Forum parallel to it. There people will have the opportunity to learn - and exchange opinions on aspects of training. In his speech Jack Dusseldorp corrected his reference to sponsors using the term sponsor partners – which far better captures the vision shared by Festo, the Event Sponsor of the Skills Competition in Seoul.